This post will demonstrate how to build a simple Clojure Web application, with Compojure, that will use Incanter to generate a sample from a normal distribution with parameters (size, mean, and standard deviation) provided by the user, and then return a PNG image of the histogram of the data. This example is simple, but it demonstrates how to dynamically generate an Incanter chart and pass it directly to the Web client as a PNG image. For more information on the Compojure Web framework, visit its Github repository, its Google group, its WikiBooks site, and this quick tutorial. I will use the Leiningen build tool to download dependencies, compile the application, and package it up as jar file. For more information on installing and using Leiningen, see my previous post. Let’s start off by creating a project directory, I’ll call it incanter-webapp, and give it a src subdirectory. Then create the following Leiningen project.clj file in the project directory. :description "A simple Incanter web-app." This project file includes two dependencies, Incanter and Compojure, and indicates that the -main function for the project is in the file simple_web_app.clj in the src subdirectory of the project. Next create the file called simple_web_app.clj in the src subdirectory. Note that the namespace for this file is simple_web_app with underscores like in the file name and in the :main line of the project.clj file. In Compojure, you need to define routes, which in this case associate the function sample-form with “/”, and the function gen-samp-hist-png with “/sample-normal”. The function gen-samp-hist-png takes four arguments, a request object, the sample size, the population mean, and the population standard deviation, and then updates the Compojure response object to include an Incanter histogram of a sample from a normal distribution with the given parameters. Now define the gen-samp-hist-png function; start by converting the string-arguments, passed in from the params object, into numbers. Each argument has a default value, 1000 for size, 0 for mean, and 1 for the standard deviation (sd). 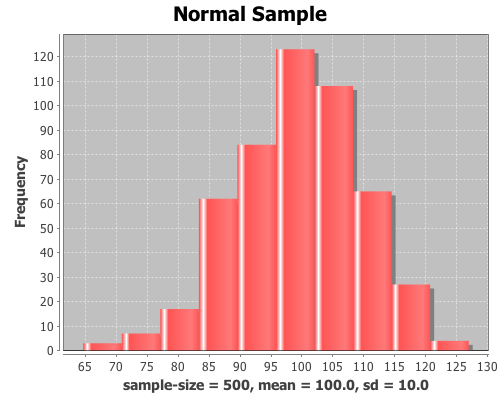 Next generate the sample from the normal distribution using Incanter’s sample-normal function with the given size, mean, and standard deviation, and then create a histogram of the resulting data. I’ve used the x-label option of the histogram function to customize the x-axis label so that it includes the given sample size, mean, and standard deviation. Next, we need to convert the histogram into a byte array, and feed that into a ByteArrayInputStream that can be passed to Compojure’s update-response function, along with a header that sets the Content-Type to “image/png”. The above code is the key to sending a dynamically generated chart directly to the client. In addition to a filename, an OutputStream can be passed to Incanter’s save function; in this case, we use a ByteArrayOutputStream, which is then converted to a byte array that is used to initialize the ByteArrayInputStream that is passed to update-response. We can create a Web form for submitting requests to /sample-normal. The following function is a helper function that creates a simple html page skeleton. Now define the sample-form function, which will generate a Web form using html-doc. This function was associated with “/” earlier using the defroutes macro. Now, we need to create a -main function that will be called when the incanter-webapp.jar is executed. This function will call Compojure’s run-server function, starting the built-in Jetty server on port 8080. Now we can use Leiningen to download and install all the necessary dependencies, including Incanter and Compojure, and then build and package the app. The complete code for this example can be found here, and the Leiningen project file can be found here. This entry was posted in clojars.org, Clojure, compojure, Incanter, Leiningen. Bookmark the permalink. It worked out of the box for me (but if anyone is cutting/pasting the code chunks from this web page, rather than the raw code file, remember to remove ‘amp;’ from ‘&’ (two occurrances), as well as the third right-bracket ‘)’ at end of the line ‘(Double/parseDouble sd-str)))’ before compiling). Thanks for catching those bugs, I just fixed them. To avoid any other weirdness introduced by cutting/pasting html, it’s probably best to grab the complete code from the link at the end of the post, or from the latest Incanter distribution in the examples/blog/projects/simple_web_app/ directory. One more thing that might be useful. How would you recommend developing at a REPL with this setup? As it stands and code changes require a rebuild and restart of the server. yeah I’ve seen that video. It’s a good demo but it’s not going into the detail of how you would get slime to pick up the clojure version and all the other jars downloaded by lein. If I figure out how to do the same for emacs+slime I’ll post it here. Now you should be able to make changes to the running app. This does NOT work with newer versions of Compojure. That is true, Compjure 0.4 was a complete refacter of the library. I was looking for a Compojure kick-start and this article gives me what I need to understand Compojure. I managed to update the code in this post for use with the present libraries. The HTML generation has changed a bit (now it is dome by hiccup). Here is a good example of the new library usage.